Hosted PBX is a cloud based Virtual PBX Service delivered over a broadband connection. As opposed to traditional telephone systems which are installed at the business premises, the entire PBX system is delivered and managed from a secure Australian based data centre and accessed entirely through the internet. The system delivers functionality unmatched by on-premise PBX phone systems. It's the replacement technology where SIP Trunks are used instead of telephone lines and IP Phones replace the PBX handsets. 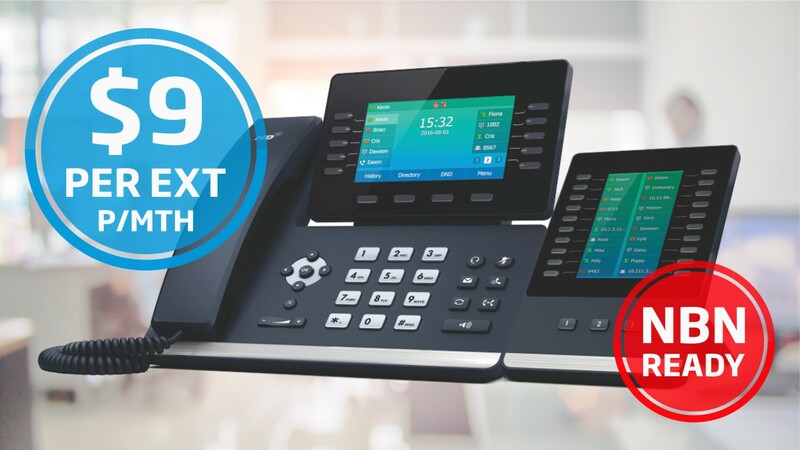 Pre-configured IP phones are simply plugged into the company's LAN and utilise the broadband connection to deliver an enterprise grade PBX service. BusinessCom offers 3 ultra-competitive hosted PBX plans to choose from. They are no contract plans, offering complete flexibility, superior functionality and cheap call rates. Pricing excludes GST. All timed calls are billed on a per Second basis. Upgrade to Hosted PBX. Reduce Costs and Gain Superior Functionality. Cloud based PBX systems are fully scalable, offer unprecedented flexibility, require low capital expenditure and are virtually maintenance free. Create a fully functional business PBX system with only 2 extensions at a fraction of the cost of an on-premise system. Add extensions as your business grows to as many as required. Rapid provisioning means any new extensions are activated and configured within hours, not days. Save costs and gain complete flexibility by not having to install traditional telephone lines. Physical installation of the PBX system is limited to connecting the IP phones to your broadband network. There is no other on-premise equipment, and to relocate all you have to do is unplug the handsets and transfer to the new premises. Calls are free between PBX extensions, regardless of where they are in the world. Equipment cost is limited to the purchase of the IP handsets with a large selection of business grade phones costing less than $100. There is no other on-premise equipment necessary and that means no on-going maintenance. The system comes complete with every feature and function that your business may need. They can be utilised depending on your business requirements. As opposed to IP-PBX systems which require regular software updates, a hosted PBX system is delivered as a complete service. It's always up to date with the latest software. Being cloud based, hosted PBX extensions can be configured onto one system and used anywhere there is a suitable broadband connection. Businesses can then deploy extensions across any number of offices, remote sites, and even overseas. Make immediate changes to system configuration without the need for a PBX technician. Being an enterprise grade Virtual PBX system, it comes with full redundancy and a disaster management process. Automatic failover to an alternative site and immediate restoration through auto-provisioning will ensure your business stays connected. BusinessCom PBX is powered by one of Australia's leading providers of cloud based PBX systems, with an extensive network here and overseas. It has an uptime SLA of 99.999% and utilises some of the best technology available. The PBX system utilises cloud based technology to provide sophisticated phone system functionality without the need to invest in PBX software or hardware. It's delivered as a service and on a per extension basis, making it very cost effective and not requiring a significant CAPEX investment. Unlike most traditional phone systems, all features and functions are included and there is no need to purchase additional functionality. Simply choose features best suited to your business and turn them on or off as required. Call handling features designed to ensure every call creates an outstanding caller experience. Auto Attendant (IVR) to help you manage your calls; Business Intro Messages to create a great first impression; Voice2Email to never miss a call, On-Hold Music and Promotional Messages to retain your callers and promote your business; Call Queuing, Auto Divert and Do Not Disturb to make sure that every call gets handled properly. Professional call management features that unite your business regardless of where your staff are located. Hunt and Ring Groups to ensure that every call is answered correctly, Any Extension Pick-Up, Call Park and Call Transfer to help you manage incoming calls. Advanced call features that allow your staff to be more productive and in control of every call. Multi-Party Conferencing for immediate teleconferencing; Personalised Ring Tones to identify specific calls; Mobility Function to take your office phone anywhere you go; and Remote Office for a unified business image. Hosted or Virtual PBX is the replacement technology for traditional phone systems. You can reduce your costs and capital expenditure, gain features and functionality, and improve business efficiency by upgrading your PBX system. On-Premise systems need to be installed on-site requiring significant capital expenditure and installation costs, including programming and maintenance expenses. And if your business moves locations, it needs to be re-installed and re-programmed. A Virtual PBX system doesn't require any physical telephone lines or any PBX equipment to be installed at the premises. There is no maintenance or on-site programming and relocating is as simple as un-plugging the IP phones. With Virtual PBX, there is only one system for the whole business and includes any remote extensions. If your business has multiple offices or remote workers, there is no need to install separate PBX systems or phone lines. A Virtual PBX system comes with all the features and functions that can be turned on and off as required. Unlike On-Premise Systems, there is no need to install additional functionality or organise a technician visit. Virtual systems are easily scalable with rapid provisioning of new extensions. IP phones are auto provisioned through the broadband connection and don't require any physical programming. A virtual system offers superior business continuity and disaster recovery functions with immediate failover and reinstatement of services. An on-premise system needs to be re-installed in case of an emergency situation such as a fire. Virtual PBX or Hosted PBX? What's the Difference? Both refer to the same type of service. Quite simply, as internet evolved over the years, new terminology appeared and became the 'newest' way of describing the technology. Virtual PBX originates from virtual computing which allows users to access software applications remotely by using the internet. The PBX is essentially a piece of software housed in a data centre. It's accessed via the internet through the IP phone or a SoftPhone. In exactly the same way, Hosted PBX is a means of deploying a service via the internet where the software is hosted off premise by a provider. A hosted PBX system is a cloud based software program that delivers PBX functionality over the internet using a cluster of servers located in a data centre. Multiple data centres are typically used for redundancy. The software has the ability to deliver a vast number of individual PBX systems with each one being allocated a specific user ID and IP address. The system is integrated with business VoIP and uses SIP trunks to make and receive phone calls over the PSTN (Public Switched Telephone Network). A landline telephone number allocated to the PBX extensions is used to make and receive calls. As every PBX system is allocated a unique ID and partition, the main system and the extensions can be configured with specific call handling and call management instructions. Being a cloud based system, this can be done online and in real time, without the need for a PBX technician to visit the premises. In order for the hosted PBX system to work, an IP phone (softphone or hardware) must be configured with the necessary credentials and connected to a suitable broadband connection. Every IP phone is allocated an extension number and provisioned onto the main hosted PBX system. Using the unique MAC address of the IP phone, auto provisioning enables the phone to configure itself once its connected to the internet. When making a call, the IP phone communicates with the hosted PBX software at the data centre, which in turn uses a SIP trunk to route the call to the destination. SIP trunks are connected to the PSTN (Public Switched Telephone Network) which enables it to the deliver the call to any destination with an active telephone number. When an outside call is being made to the hosted PBX extension direct-in-dial number or the main phone number, it is received by the hosted PBX system from the PSTN network and delivered to the intended IP phone via the internet. For further information or to discuss your requirements please call 1300 000 300 or CLICK HERE to make an online enquiry. What Type of Phones Does Hosted PBX Use? A hosted PBX system can use a variety of IP (Internet Protocol) phones to operate. It can either be a hardware phone or a softphone. These phones are specifically designed to be used for VoIP calls and IP telephony. An IP desk phone is a hardware type IP phone that looks and operates like a traditional phone. It is specifically designed to be used for VoIP calls. There is also a variety of IP Conference Phones available which are designed to be used in meeting rooms. An IP softphone is a software program that is installed onto a PC or laptop. It can also be a mobile app for use with a mobile phone. When connected to a suitable internet service, it is used to create a phone connection on the device. The device, either the computer or the mobile phone, uses its microphone and speakers to enable a conversation. A phone headset with both a microphone and head speakers may have to be used. Do IP Phones Need to be Hard Wired? No. In both cases, either a hardware phone or softphone, can use a WiFi or 4G internet connection to make and receive phone calls. Please note that the hardware IP phone must have the feature to enable it to connect to a WiFi network. There are a number of Yealink models that are capable of doing that. What Is the Call Quality When Compared to Traditional Phone Systems? BusinessCo hosted PBX uses enterprise grade SIP trunks to enable phone calls. They offer a much higher level of service provision than traditional phone lines including ISDN services that rely on the copper network. However, call quality can be effected by the type of internet connection being used, quality of the LAN (Local Area Network) and the local router being utilised. What Happens If I Lose Power at the Premises? Loss of power usually means the internet goes down as well as no power to the IP phones. And that means you will not be able to make or receive phone calls. However, the benefit of a hosted PBX system is that you can program automatic failover when that occurs. As the actual PBX system is housed in a data centre in another location, the power failure does not effect it. It will still keep on operating and can be programmed to automatically route the incoming calls to another destination, which can be another office or a mobile number. That setting can be activated at any time by contacting our Customer Care Team. How Much Bandwidth Do I Need for my Hosted PBX System? Hosted PBX uses 100kbps, both upload and download, to make one continuous phone call without any interference. As a general rule, you should allocate 100kbps of bandwidth per extension. It is also advisable to invest in a good quality business router with a QoS feature. Yes. BusinessCom has Local Number Portability (LNP) agreements with all the major carriers. Existing numbers can be ported (migrated) to our network from any type of phone line technology. Once ported, they will no longer be attached to a specific telephone exchange. This is of great benefit as the number will become fully portable and not restricted to a specific geographical area. And that means if you move premises, the number automatically moves with you. Do I Need to Allocate a DID (Direct-In-Dial) Number to Every Extension? No, as long as you don’t require the extensions to receive outside calls directly. Every extension is allocated an extension number within the hosted PBX system and there is no need to allocate a dedicated landline number. However, that means that all calls are received by the main PBX system and routed to a specific extension, which is usually the reception phone.